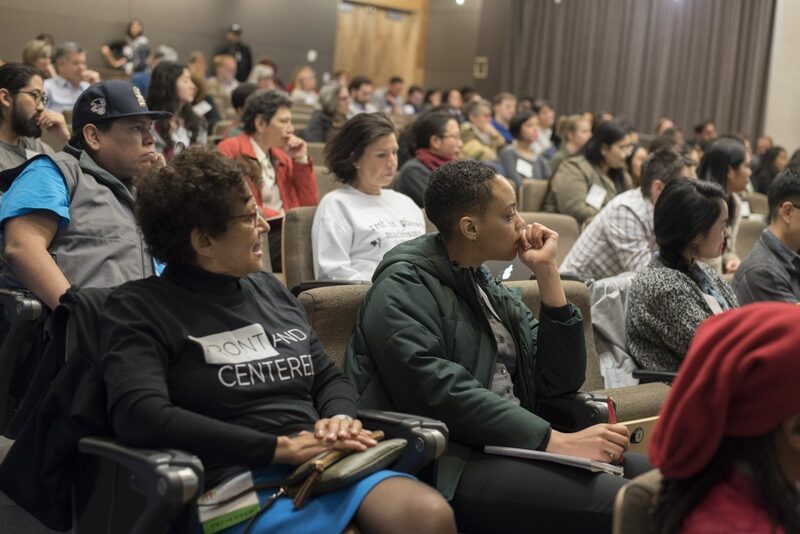 On Jan. 11 and Jan. 12, Front and Centered hosted our Statewide Environmental Justice Summit at University of Washington’s (UW’s) Alder Auditorium. We were inspired by the response, maxing out Summit capacity at 225 participants. Never before have this many leaders of color and indigenous leaders across our state gathered in one space for two days specifically to connect on local environmental justice and climate issues. Coming from Yakima, Bellingham, and Tacoma to Seattle, participants took this rare opportunity to gather new tools and connect our efforts to restore our environment and the health of our people. The Summit came on the heels of a groundbreaking year for advocates of color in environmental justice. We helped author the nation’s most progressive climate policy, Initiative 1631, a fee on polluters to equitably fund clean energy solutions, create jobs and clean our air. We shifted the narrative to the front lines of climate change where our communities disproportionately suffer the worst environmental impacts. Click on photo to see the full album! At the Summit, we pushed our collective knowledge and power forward. Shout out to our steering committee for putting muscle and adding their wisdom to this gathering. We are so fortunate and thankful for your leadership during a deeply critical time in the environmental and climate justice movement. Many of you presented your work, including Rosalinda Guillen and Edgar Franks (Community to Community); Jill Mangaliman (Got Green); Nicole Vallestero Keenan-Lai (Puget Sound Sage), Joseph Shoji Lachman (Asian Pacific Islander Coalition), Peter Bloch Garcia (recently of Latino Community Fund); and Susan Balbas and Pah-tu Pitt (Na’ah Illahee Fund). The Summit opened with a powerful blessing and welcome from Pastor Gregory Christopher of Tacoma’s Shiloh Baptist Church and Duwamish Tribe Council Member Ken Workman, a direct descendent of Chief Sealth. We launched, dialogued and organized around the Washington Environmental Health Disparity Map, an interactive tool two years in the making that Front and Centered developed in partnership with the UW Department of Environmental & Occupational Health Sciences, the Washington State Department of Health, Puget Sound Clean Air Agency and the Washington State Department of Ecology. In tandem, we also introduced our bill, the Healthy Environments for All (HEAL) Act, which would commit state agencies to a mission of environmental justice and require them to address environmental health disparities for investment, policy and enforcement decisions. We were grounded in plenary presentations on the history of the environmental justice movement led by communities of color (with guest speakers Jill Mangaliman, Edgar Franks and Matt Remle), frameworks for ecological justice (with guest speakers Pah-tu Pitt and Nicole V. Keenan-Lai) and a special intimate conversation with Senator Rebecca Saldana on the HEAL Act. We discussed a range of emerging issues in ecological, climate and environmental justice issues, diving deep with forums on equitable governance, regenerative economy, clean energy, clean water, as well as urban place-based strategies, rural place-based self-determination, electric vehicles and homes and Washington’s new economy. We got inspired to create change through forums on designing your own campaign, storytelling and art, equity-driven fundraising and using environmental health disparities data as an organizing tool. We toasted to our work together and future together at our public reception on Jan. 11. #POCPower with allies in climate action! Check out more photos from our Summit here! Stay in touch with us! Sign up for our newsletter to receive regular updates via email.